American test pilot mission specialist astronaut 1992-1999. Status: Inactive; Active 1992-1999. Born: 1950-08-06. Spaceflights: 2 . Total time in space: 24.61 days. Birth Place: Miami, Florida. PERSONAL: Born August 6, 1950, in Miami, Florida. Married to the former Marilyn K. Robinson. They have two children. He enjoys martial arts and holds a 2nd degree black belt in Shotokan karate. He also enjoys music, and plays trumpet with various bands along the Cape Canaveral Space Coast. In addition he remains an active pilot flying various aircraft. Winston's father, Alston Scott, resides in Miami, Florida. His mother, Rubye Scott, is deceased. EDUCATION: Graduated from Coral Gables High School, Coral Gables, Florida, in 1968; received a bachelor of arts degree in music from Florida State University in 1972; a master of science degree in aeronautical engineering from the U.S. Naval Postgraduate School in 1980. Awarded honorary doctorates from Florida Atlantic University in 1996, and Michingan State University in 2007. ORGANIZATIONS: American Institute of Aeronautics & Astronautics; Aircraft Owners and Pilots Association; Experimental Aircraft Association; Skotokan Karate Association; Association of International Tohgi Karate-Do; Bronze Eagles Association of Texas. EXPERIENCE: Scott entered Naval Aviation Officer Candidate School after graduation from Florida State University in December 1972. He completed flight training in fixed-wing and rotary-wing aircraft and was designated a Naval Aviator in August 1974. He then served a 4-year tour of duty with Helicopter Anti-Submarine Squadron Light Thirty Three (HSL-33) at the Naval Air Station (NAS) North Island, California, flying the SH-2F Light Airborne Multi-Purpose System (LAMPS) helicopter. In 1978 Scott was selected to attend the Naval Postgraduate School at Monterey, California, where he earned his Master of Science degree in aeronautical engineering with avionics. After completing jet training in the TA-4J Skyhawk, Scott served a tour of duty with Fighter Squadron Eighty Four (VF-84) at NAS Oceana, Virginia, flying the F-14 Tomcat. In June 1986 Scott was designated an Aerospace Engineering Duty Officer. He served as a production test pilot at the Naval Aviation Depot, NAS Jacksonville, Florida, flying the F/A-18 Hornet and the A-7 Corsair aircraft. He was also assigned as Director of the Product Support (engineering) Department. He was next assigned as the Deputy Director of the Tactical Aircraft Systems Department at the Naval Air Development Center at Warminster, Pennsylvania. As a research and development project pilot, he flew the F-14, F/A-18 and A-7 aircraft. Scott has accumulated more than 5,000 hours of flight time in 20 different military and civilian aircraft, and more than 200 shipboard landings. Additionally, Scott was an associate instructor of electrical engineering at Florida A&M University and Florida Community College at Jacksonville, Florida. 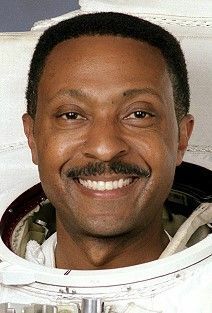 Winston Scott retired from NASA and the U.S. Navy at the end of July 1999 to accept a position at his alma mater, Florida State University, as Vice President for Student Affairs. He was also associate dean in the FAMU/FSU College of Engineering. In July 2003 Scott assumed the position of executive director of the Florida Space Authority. In this capacity he advised Florida’s governor and legislators on all matters related to space and aeronautics within the state of Florida. Scott was also a part time professor of aeronautics at the Florida Institute of Technology in Melbourne, Florida. In September 2006 he became Vice President and Deputy General Manager of the engineering and science contract group for Jacobs Engineering in Houston, Texas. Winston Scott’s new book, "Reflections From Earth Orbit," was published by Apogee Books, C.G. Publishers in July 2005 and is available from all book stores and on line distribution sources. NASA SPACE FLIGHT EXPERIENCE: Scott was selected by NASA in March 1992, and reported to the Johnson Space Center in August 1992. He served as a mission specialist on STS-72 in 1996 and STS-87 in 1997, and has logged a total of 24 days, 14 hours and 34 minutes in space, including 3 spacewalks totaling 19 hours and 26 minutes. STS-72 Endeavour (January 11-20, 1996) was a 9-day flight during which the crew retrieved the Space Flyer Unit satellite (launched from Japan 10-months earlier), deployed and retrieved the OAST-Flyer satellite, and conducted two spacewalks to demonstrate and evaluate techniques to be used in the assembly of the International Space Station. The mission was accomplished in 142 orbits of the Earth, traveling 3.7 million miles, and logged him a total of 214 hours and 41 seconds in space, including his first EVA of 6 hours and 53 minutes. STS-87 (November 19 to December 5, 1997) was the fourth U.S Microgravity Payload flight, and focused on experiments designed to study how the weightless environment of space affects various physical processes, and on observations of the Sun's outer atmospheric layers. Scott performed two spacewalks. The first, a 7 hour 43 minute EVA featured the manual capture of a Spartan satellite, in addition to testing EVA tools and procedures for future Space Station assembly. The second spacewalk lasted 5 hours and also featured space station assembly tests. The mission was accomplished in 252 Earth orbits, traveling 6.5 million miles in 376 hours and 34 minutes. Born August 6, 1950, in Miami, Florida. Married to the former Marilyn K. Robinson. They have two children. He enjoys martial arts and holds a 2nd degree black belt in Shotokan karate. He also enjoys music, and plays trumpet with a Houston-based Big Band. In addition to flying general aviation aircraft, he is an electronics hobbyist. Winston's father, Alston Scott, resides in Miami, Florida. His mother, Rubye Scott, is deceased. Marilyn's parents, Albert and Josephine Robinson, reside in Chipley, Florida. Graduated from Coral Gables High School, Coral Gables, Florida, in 1968; received a bachelor of arts degree in music from Florida State University in 1972; a master of science degree in aeronautical engineering from the U.S. Naval Postgraduate School in 1980. American Institute of Aeronautics & Astronautics; National Naval Officers Association; Naval Helicopter Association; Alpha Phi Alpha Fraternity; Phi Mu Alpha Sinfonia Fraternity; Skotokan Karate Association; Association of International Tohgi Karate-Do; Bronze Eagles Association of Texas. Scott entered Naval Aviation Officer Candidate School after graduation from Florida State University in December 1972. He completed flight training in fixed-wing and rotary-wing aircraft and was designated a Naval Aviator in August 1974. He then served a 4-year tour of duty with Helicopter Anti-Submarine Squadron Light Thirty Three (HSL-33) at the Naval Air Station (NAS) North Island, California, flying the SH-2F Light Airborne Multi-Purpose System (LAMPS) helicopter. In 1978 Scott was selected to attend the Naval Postgraduate School at Monterey, California, where he earned his master of science degree in aeronautical engineering with avionics. After completing jet training in the TA-4J Skyhawk, Scott served a tour of duty with Fighter Squadron Eighty Four (VF-84) at NAS Oceana, Virginia, flying the F-14 Tomcat. In June 1986 Scott was designated an aerospace engineering duty officer. He served as a production test pilot at the Naval Aviation Depot, NAS Jacksonville, Florida, flying the F/A-18 Hornet and the A-7 Corsair aircraft. He was also assigned as Director of the Product Support (engineering) Department which consisted of 242 engineers, technicians, logistics managers, and administrative personnel. He was next assigned as the Deputy Director of the Tactical Aircraft Systems Department at the Naval Air Development Center at Warminster, Pennsylvania. As a research and development project pilot, he flew the F-14, F/A-18 and A-7 aircraft. Scott has accumulated more than 3,000 hours of flight time in 20 different military and civilian aircraft, and more than 200 shipboard landings. Additionally, Scott was an associate instructor of electrical engineering at Florida A&M University and Florida Community College at Jacksonville, Florida. Scott was selected by NASA in March 1992, and reported to the Johnson Space Center in August 1992. He was initially assigned to the Astronaut Office Mission Support Branch, serving with the Astronaut Support Personnel team supporting Space Shuttle launches and landings at the Kennedy Space Center in Florida. Most recently, Scott served as a mission specialist on STS-72 (January 11-20, 1996). During the 9-day flight the crew aboard Endeavour retrieved the Space Flyer Unit (launched from Japan 10-months earlier), deployed and retrieved the OAST-Flyer, and conducted two spacewalks to demonstrate and evaluate techniques to be used in the assembly of the International Space Station. In completing his first space flight, Scott orbited the Earth 142 times, traveled 3.7 million miles, and logged a total of 214 hours and 41 seconds in space, including a spacewalk of 6 hours and 53 minutes. Scott will serve as a mission specialist on the crew of the fourth U.S. Microgravity Payload flight scheduled for an November 1997 launch on board Columbia on mission STS-87. Family: Astronaut. Country: USA. Flights: STS-72, STS-87. Projects: STS. Agency: USN. Bibliography: 12, 5994. 1950 August 6 - . Birth of Winston Elliott Scott - . Nation: USA. Related Persons: Scott, Winston. American test pilot mission specialist astronaut 1992-1999. 2 spaceflights, 24.6 days in space. Flew to orbit on STS-72 (1996), STS-87..
1996 January 11 - . 09:41 GMT - . Launch Site: Cape Canaveral. Launch Complex: Cape Canaveral LC39B. Launch Platform: MLP1. LV Family: Shuttle. Launch Vehicle: Space Shuttle. STS-72 - . Call Sign: Endeavour. Crew: Barry, Chiao, Duffy, Jett, Scott, Winston, Wakata. Payload: Endeavour F10 / OAST / FSU. Mass: 6,510 kg (14,350 lb). Nation: USA. Related Persons: Barry, Chiao, Duffy, Jett, Scott, Winston, Wakata. Agency: NASA Houston. Program: STS. Class: Manned. Type: Manned spaceplane. Flight: STS-72. Spacecraft Bus: Shuttle. Spacecraft: Endeavour. Duration: 8.92 days. Decay Date: 1996-01-20 . USAF Sat Cat: 23762 . COSPAR: 1996-001A. Apogee: 310 km (190 mi). Perigee: 302 km (187 mi). Inclination: 28.50 deg. Period: 90.60 min. Deployed and retrieved OAST Flyer; retrieved SFU Space Flyer Unit. Beside the two satellite retrievals, the mission included two spacewalks..
1996 January 17 - . 05:40 GMT - . EVA STS-72-2 - . Crew: Chiao, Scott, Winston. EVA Duration: 0.29 days. Nation: USA. Related Persons: Chiao, Scott, Winston. Program: STS. Class: Manned. Type: Manned spaceplane. Flight: STS-72. Spacecraft Bus: Shuttle. Spacecraft: Endeavour. Tested tools and techniques for extravehicular activity..
1996 January 20 - . Landing of STS-72 - . Return Crew: Barry, Chiao, Duffy, Jett, Scott, Winston, Wakata. Nation: USA. Related Persons: Barry, Chiao, Duffy, Jett, Scott, Winston, Wakata. Program: STS. Flight: STS-72. STS-72 landed at 07:42 GMT. .
1997 November 19 - . 19:46 GMT - . Launch Site: Cape Canaveral. Launch Complex: Cape Canaveral LC39B. Launch Platform: MLP1. LV Family: Shuttle. Launch Vehicle: Space Shuttle. STS-87 - . Call Sign: Columbia. Crew: Chawla, Doi, Kadenyuk, Kregel, Lindsey, Scott, Winston. Payload: Columbia F24 / Spartan / USMP-4 Aft. Mass: 115,900 kg (255,500 lb). Nation: USA. Related Persons: Chawla, Doi, Kadenyuk, Kregel, Lindsey, Scott, Winston. Agency: NASA Houston. Manufacturer: North American. Program: STS. Class: Manned. Type: Manned spaceplane. Flight: STS-87. Spacecraft Bus: Shuttle. Spacecraft: Columbia. Duration: 15.69 days. Decay Date: 1997-12-05 . USAF Sat Cat: 25061 . COSPAR: 1997-073A. Apogee: 279 km (173 mi). Perigee: 273 km (169 mi). Inclination: 28.50 deg. Period: 90.00 min. OV-102 Columbia was launched on a microgravity science mission. Spartan 201 was released a day late on November 21. However the satellite did not start its automatic orientation maneuver because the crew failed to send it the correct commands prior to release. Spartan was recaptured by hand, during a spacewalk by Takao Doi and Winston Scott on November 25. Tests of space station tools went well, but the free-flying Sprint camera subsatellite was not deployed due to lack of time. NASA decided not to redeploy Spartan on this mission. During an EVA on Dec 3, Doi and Scott carried out more tests of the Space Station crane. They also deployed the AERCam/Sprint 'football' remote-controlled camera for a free flight in the payload bay. Columbia landed on December 5, with a deorbit burn at 11:21 GMT. Touchdown was at 12:20 GMT at Kennedy Space Center. 1997 November 25 - . 00:02 GMT - . EVA STS-87-1 - . Crew: Doi, Scott, Winston. EVA Duration: 0.32 days. Nation: USA. Related Persons: Doi, Scott, Winston. Program: STS. Class: Manned. Type: Manned spaceplane. Flight: STS-87. Spacecraft Bus: Shuttle. Spacecraft: Columbia. Retrieved Spartan free-flier. Tested EVA tools and techniques..
1997 December 3 - . 09:09 GMT - . EVA STS-87-2 - . Crew: Doi, Scott, Winston. EVA Duration: 0.21 days. Nation: USA. Related Persons: Doi, Scott, Winston. Program: STS. Class: Manned. Type: Manned spaceplane. Flight: STS-87. Spacecraft Bus: Shuttle. Spacecraft: Columbia. Tested tools and techniques for extravehicular activity..
1997 December 5 - . Landing of STS-87 - . Return Crew: Chawla, Doi, Kadenyuk, Kregel, Lindsey, Scott, Winston. Nation: USA. Related Persons: Chawla, Doi, Kadenyuk, Kregel, Lindsey, Scott, Winston. Flight: STS-87. STS-87 landed at 12:20 GMT. .